We strongly recommend calling ahead before visiting so that we may be best prepared to meet your specific needs, whether you are looking to rent or purchase an instrument or need an adjustment or repair. Midwest String Rentals is located in Chicago's Loop, near Symphony Center and the Art Institute of Chicago. Convenient paid garage parking is just east of the building at 17 E Adams. We are close to numerous bus and train routes; CTA Red and Blue Lines stop nearby at Jackson while Purple, Brown, Green, Orange, and Pink Lines are steps away at Adams and Wabash. Whether it's a rental instrument or your own violin, viola, or cello, you'll want to keep it looking and sounding its best to ensure your continued enjoyment of it. 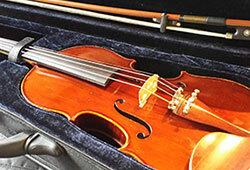 Read these easy-to-follow tips for caring for your instrument and bow. Looking for Darnton & Hersh? Darnton & Hersh Fine Violins, expert appraisers, restorers and dealers in violin family instruments and bows, offers for sale a selection of violins, violas and cellos ranging from the most exceptional antique Italian instruments to more affordable but fully playable instruments. We also offer bows in all price ranges including those by the finest French masters. D&H is the parent company to, and shares space with, Midwest String Rentals. Copyright © 2019 · Midwest String Rentals Ltd.